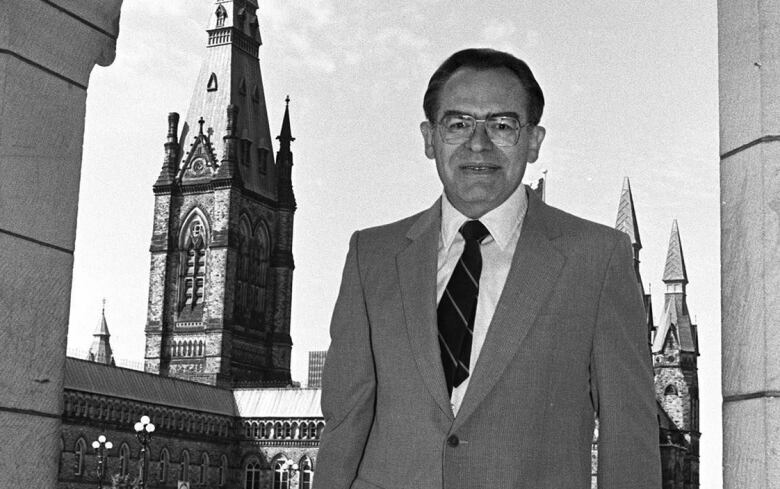 Herb Gray, a former deputy prime minister and Canada's first Jewish federal cabinet minister, has died at the age of 82. Herb Gray, a former deputy prime minister and Canada's first Jewish federal cabinet minister, has died at the age of 82, the federal Liberal Party announced late Monday night. Gray was elected to Parliament for the first time in 1962. He served the district of Windsor West for almost four decades, making him one of the longest-serving MPs in Canadian history. "[He] has left behind an immense legacy unmatched by most in Canadian history," Liberal Leader Justin Trudeau said in a statement. "Beloved by all, Herb devoted a lifetime to his party and his country, in both good times and bad." Trudeau said he and his wife join Canadians in "mourning the loss of one of Canada's great statesmen." He was notorious for his stability as a politician. He was "the Liberal Party's version of the Rock of Gibraltar," Don Boudria, a former Canadian politician, once said. His wife of 46 years, Sharon Sholzberg-Gray, said he was equally steadfast to his family. "I think he'd like to be remembered as someone who tried to serve the people of Canada the best he could, in particular the people of Windsor that elected him and re-elected him 13 times," she told the CBC's Julie Van Dusen. "But above all, he wanted to be remembered as a husband and a father and a grandfather, because that was so important to him. "It's important also to note that you can lead a public life and have a wonderful family life as well." Sholzberg-Gray said her husband loved his hometown of Windsor and counted among his greatest accomplishments negotiating a loan guarantee for the "failing" Chrysler corporation when he was industry minister that meant the company's untried new vehicle, the minivan, would be made exclusively at its Windsor plant. "Herb was always very futuristic and he was right, and the minivan became very popular and it's something people are still using today as a go-to car," she said. Former prime minister John Turner, who along with Gray was first elected to Parliament in 1962, said he introduced Gray to Sharon, who was a campaign worker for Turner. "So Herb and I remained good friends. He was a great Canadian," Turner said. "We saw eye to eye on most issues. He was a formidable parliamentarian. "He knew what people were thinking. He asked questions, he listened more than he talked and he was just a natural man of the people," Turner said. Opposition Leader Tom Mulcair offered condolences for "an esteemed politician who devoted his life to public service." "Catherine and I offer our heartfelt respect to Mr. Gray for his dedication and outstanding contributions to Canada," Mulcair said in a statement released Tuesday. Flags were lowered to half-mast on all federal government buildings in Ottawa Tuesday and will remain that way until sundown on the day of Gray's funeral. The flag on the Peace Tower on Parliament Hill will be flown at half-mast on that day as well. Gray's funeral is set for Friday in Ottawa. Gray will not receive a state funeral, which are usually reserved for prime ministers, governors general and sitting cabinet ministers, although former finance minister Jim Flaherty was laid to rest with a state funeral last week. "Mr. Gray was a great Canadian and a tremendous parliamentarian who served with honour and dignity," said Jason MacDonald, in an email to CBC News. "We are offering to support Mr. Gray's family with the planning and logistics of his funeral." Gray served in many cabinet positions and was appointed deputy prime minister by former prime minister Jean ​Chrétien in 1997. He retired from federal politics in 2002. “Throughout his career, Gray was guided by principles of social justice, good governance, sound democratic processes and programs that create opportunities for all,” the Liberal Party statement read. He went on to spend eight years as the Canadian chair of the International Joint Commission of Canada and the United States. In 2008, he became Carleton University's tenth chancellor. Gray and his wife, Sharon, had two children and eight grandchildren. He was a Companion of the Order of Canada and received numerous accolades from universities, governments and community organizations, including the inaugural Laurier Leadership Award from the Liberal Party of Canada. In 2012, the Windsor-Essex Parkway project was renamed the Herb Gray Parkway in honour of the former MP. At the time, Gray said he missed everything about his hometown of Windsor. "It's my home city," he said. "I grew up here. I represented it in Parliament. People were very friendly. Very supportive. So I have wonderful memories." On mobile? Read the online reaction to Herb Gray's death here.